The Urban Friction 2017-2018 seminar series, organized by the [urban interfaces] research group, existed of four sessions. In one of those sessions, participants were invited to partake in a two-day pressure cooker revolving around the idea of “critical making”. As a term that was originally coined by Mark Ratto, critical making emphasizes the process of making through critical thinking itself rather than the end product that results from this. Through critical making one reflects on, and critically looks at, the cultural values that are embedded in certain objects, encouraging a “re-evaluation of technology in culture”. Here, Ratto stresses criticality and expression as opposed to technical refinement or utility. [Critically made objects] can enable individuals to reflect on the personal and social impact of new technologies, and provide a provocative, speculative, and rich vision of our technological future that avoids the clichés of consumerist-oriented industrial design. This stance towards a critical making process was reflected in the Urban Friction workshop by the array of practitioners that gave short presentations on their experience with critical, hands-on making. The first one to take the stage was Klaas Kuitenbrouwer who explored the origins – and a Dutch re-appropriation – of the concept of critical making within the creative sector of the Netherlands. On the one hand, there are designers who work in a creative industry that has a clear, economical set of values directed at making profit. On the other hand, there are the fine arts, who are not seen as being part of this industry. What is lacking from the creative industries, Kuitenbrouwer stated, is critical thinking, and the fine arts need better intervening possibilities. As a concluding remark, Kuitenbrouwer proposed to bridge the gap of this dichotomy, aiming towards design processes in which we both critically reflect and creatively intervene at the same time. The following speaker, Fabian van Sluijs, explored with us the possibilities of creating artistic expressions using technology. Thereafter, Daan Krijnen emphasized that when making public works or screens, one should always consider questions regarding accessibility. Subsequently, Ruben van de Ven offered us a glimpse into his projects in which he uses pattern recognition algorithms. He stressed that it’s always important to consider the implications of the data you use: datasets contain biases and assumptions, thus it’s crucial to remain critical. Cristina Cochior, the last speaker, echoed Van de Ven’s statement by arguing that data itself is never neutral, nor is collecting it an objective process. Through dramatizing data, Cochior aims to not just visualize this data, but make apparent certain frictions “as to provoke an empathetic or emotive response in its audience”. Inspired by these short presentations and the idea of critical making that laid the basis for this Urban Friction workshop, here, I would like to investigate an urban friction that resides within a topic of my own liking: graffiti. In particular, I will shortly investigate the friction of legal versus illegal graffiti. Thereafter, I propose Augmented Reality (hereafter: AR) as a suitable technology to possibly bypass these frictions. Finally, I will concisely reflect on the use of AR within the graffiti subculture; how does this technology fit current uses within the graffiti subculture, and what opportunities can AR offer graffiti artists? After the presentations, we were invited to start a critical making process ourselves by diving deeper into questions regarding the datafication of urban space and the urban frictions that follow therefrom. When I was reading into the use of data (processing) systems by the Utrecht municipality, I came across a DUIC article that documented a recent development in the “Fame-case”: a graffiti-related case which revolves around the placement of a graffiti tag – the word “fame” – in several Utrecht neighborhoods. What interested me, here, was the following statement of the municipality: “Because of a new software package we can look more efficiently for comparable graffiti [my translation]”. By using certain software they hope to localize and document graffiti more easily, boosting an efficient removal of tags or other illegal graffiti-works. In other words, the making of graffiti is in its essence an act on which one of the two – or more – involved parties did not agree. Writing graffiti on walls is making apparent resistance against existing power structures, working against them, not with them. Furthermore, graffiti re-evaluates and re-appropriates urban space; it points towards urban frictions and asks critical questions about them. Considering the aforementioned example of the Fame-case, a two-sided – but part of the same coin – broader urban friction is at work regarding spraying graffiti within the Utrecht municipality. Firstly, because the municipality renders spraying graffiti unlawful unless it’s placed on legalized spots, the foundational structure of the graffiti subculture is overlooked or disregarded. Furthermore, by using software to localize graffiti faster – which makes removing graffiti more efficient, and which possibly makes it easier to catch the culprits – it becomes increasingly difficult for graffiti artists to operate. Of course, I wouldn’t want to state here that stricter legislation and a sophistication of technology directly result in a declination of the graffiti subculture. What this will result in, however, is an increasingly hard position for graffiti artists within urban environments. Furthermore, I want to refrain from any value judgement on this cause. To quote Ian Gwilt, “the legitimacy and cultural acceptance of graffiti and street art varies quite dramatically and is still very much under debate” (Gwilt 2014, 190). Instead, I asked myself the following question: is there a bypass for graffiti artists, possibly one in which technological advancement can be used to their advantage? Then I came across the phenomenon of AR graffiti. Here, I’d like to shortly define and show what AR graffiti encompasses. AR graffiti does not directly suit the current Oxford Dictionaries definition of graffiti, which states that it is “writing or drawings scribbled, scratched, or sprayed illicitly on a wall or other surface in a public place”. Since AR graffiti exists as a virtual layer it is thus not physically “scribbled, scratched, or sprayed” on a surface. Indirectly, however, we could still state AR graffiti is a form of graffiti, albeit mediated digitally by a smartphone or other technology on which the graffiti artwork can be seen projected onto the environment (Gwilt 2014, 192). AR as a technology seems, for now, to be mainly used by two parties when creating graffiti. Firstly, it is used by “graffiti amateurs” or regular phone users who are interested in using the AR functions offered by their smartphones; secondly, it is used by professional designers. With regards to the first group, we have seen the emergence of several mobile applications that promise to mediate this process: WallaMe, LZRTAG, Just a Line, to name some of them. These apps allow their users to scribble lines or upload images which can be geotagged – in other words, linked to a specific location – to be seen later by other users. Here, we can identify two trends: LZRTAG, for example, needs physical markers to work (see: “Image 1”, right), while other applications like WallaMe and Just a Line recognize environments without needing tags (see: “Image 1”, left). Image 1: Left: Moving example image of Just a Line, an AR graffiti app developed by Google (source). Right: Example of the physical tags needed to use the LZRTAG application. 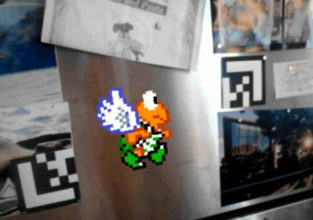 Here, you can also see the projected image, this time displaying a game sprite (source). Professional designers comprise the second group of users that deploy AR technologies through which their work is created and exhibited. One of the projects of the artist collective WERC is “AR GRAFFITI”. 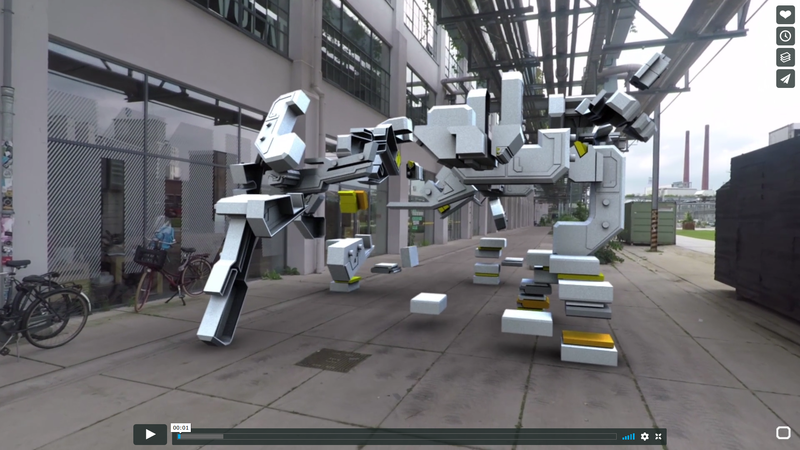 In this project, WERC augments five physical graffiti pieces with a virtual, moving layer. Another artist working with AR is AUJIK or Stefan Larsson. AUJIK has a background in the graffiti and skater subculture and integrates robotic elements, architecture, and neuroscience into his work. His AR graffiti artworks present users with moving AR images that are projected – through the use of a mobile application – on multiple environments in the city of Eindhoven (see: “Image 2”). Again, two trends can be distilled from these applications. In the first example, AR is used as a technology to enhance existing graffiti works, overlaying them with virtual, moving content. Besides that, as seen in AUJIK’s artworks, AR graffiti artworks can stand in their own right. In the latter case, what also becomes apparent is that AR graffiti can break away from the boundaries of walls or other physical surfaces, and instead “float in the air” as three-dimensional sculptures. Image 2: Screenshot of a video presenting an AR graffiti artwork, located in Eindhoven, made by the Swedish artist AUJIK. The original AR graffiti artwork presents viewers with a moving, three-dimensional image (source). But can the beforementioned examples still be seen as graffiti? How can we make sense of these virtual overlays on reality? What are the benefits of using AR as a technology when creating graffiti works? To firstly place AR graffiti in a broader historical context: augmenting reality is far from a new phenomenon. While leaning on Jonathan Culler and Dean MacCannell’s discussion on the “marker”, William Uricchio connects current AR practices with the augmentation of present objects with references to their past by using visual markers that indicate historical events (Uricchio, forthcoming article, 2). Augmentation, Uricchio argues, “whether technological (AR) or perceptual (informed ways of seeing), functions as an interface” (Uricchio, forthcoming article, 3). And these semiotic interfaces are rooted deeply into our culture in which AR technologies are just a newer way of augmenting our surroundings. Ian Gwilt explores the augmentation of reality with regards to graffiti. In a culture in which technology is increasingly embedded, AR graffiti does not sound that farfetched at all, he says. Moreover, within the graffiti subculture experimenting with new materials and techniques is quite common. The use of AR technologies as a medium to create graffiti, Gwilt states, would continue in this tradition of expanding and incorporating current and newer methods and technologies (Gwilt 2014, 191). AR software can function as a platform to digitally overlay city scenes with virtual content – images, moving pictures, audio, and text –, enhancing our experience of urban surroundings. Furthermore, says Gwilt, AR technologies make it possible to switch between analogue versions of our surroundings, and versions that include the digital overlays (Gwilt 2014, 189). This means that creating AR graffiti does not comprise an illegal act as of yet since it does not cross the boundaries of current legislation on graffiti (Gwilt 2014, 192). Thus, using AR as a technology to create graffiti works with does not seem to contradict the core principles that analogue graffiti artists pursue. Moreover, using AR technologies could even add to current applications in other ways, Conor McGarrigle says, pointing to the possibility to attach contextual data to AR works. “This offers an unprecedented opportunity for the artistic and political activation of sites with large data-led critiques, particularly in conjunction with physical intervention,” he argues (McGarrigle 2014, 82). Furthermore, since AR is an emerging technique its uses are still being negotiated, which possibly makes it a great platform for experimenting with graffiti-related uses. AR systems have yet to enter mainstream practices; what this technology will eventually encompass is still open to interpretation (McGarrigle 2014, 82). In conclusion, although still mainly being used by “graffiti amateurs” and artists rather than the regular graffiti community, AR does not make that strange of a bedfellow of graffiti. As I stated earlier, I feel it’s important to tackle questions regarding the illicit nature of spraying graffiti onto urban environments. Here, I wrote about the urban friction between the municipality who wants to enforce certain ideas onto city structures on the one hand, and the graffiti subculture that wants to show resistance towards these mechanisms of top-down power on the other. I argued that AR, as an emergent technology, could be of use for the graffiti subculture when creating their works. Although one of this subculture’s cornerstones is offering resistance through the illegal act of spraying graffiti, and although using AR technologies would make creating graffiti a more-or-less legal act, I still contend that using AR would fit the graffiti subculture – albeit via a different rationale. By working within the grey area – legal-wise – augmented reality applications reside in – for now –, graffiti artists can still operate on the boundaries of legality, asking critical questions and re-appropriating space through digitally overlaying urban environments with AR graffiti works. Although I can’t dwell on this subject too long in this short inquiry, let me reflect briefly on the “critical making” aspects AR graffiti practices could encompass. As Kuitenbrouwer proposed, in a critical making process it’s important to both critically reflect and creatively intervene at the same time. Because of AR’s affordances, using it as a platform to create and show graffiti with and on offers several interesting options. AR supports multiple formats – images, text, video, sound – thus the creative possibilities seem endless. Furthermore, as Hertz emphasized, end products can play a crucial part in enabling their viewers to reflect on certain matters. Because AR works can be contextualized by adding additional data to them, critical thoughts about how these works were created, and why these works are being shown, can be communicated to the public. Far from being an exhaustive inquiry of AR graffiti, this short paper can rather be seen as a preliminary investigation into this topic. In the future, I would like to explore more thoroughly the fit of AR and graffiti within the usual definition of the latter – should this definition be updated to suit the current array of applications that are labeled with it? Furthermore, although I did point out that AR platforms that support the creation of AR graffiti seem to be mainly used as gimmicky tools for non-graffiti artist – amateur phone users – or as a podium for professional artistic graffiti endeavors, what’s possibly more interesting is why this is the case. Could this have something to do with AR not being mainstream (enough) yet? This surely sounds like a plausible theory to me, since graffiti artists create their works to be seen, which would mean that physical graffiti still is a more attractive option – at least until the vast majority of city dwellers get interested in scanning urban environments on hidden virtual overlays. Although AR technologies are not used widely at this moment in time within the graffiti subculture, my hope is that the artworks mentioned before (amongst others) will inspire more existing, or aspiring, graffiti artists to take a dive into this fairly – graffiti-wise – unexplored ocean of opportunities. I, for one, can’t wait to add some virtual, AR complexity to my urban flânerie! Akten, Memo. “Data Dramatization.” Medium. 30-09-2015. Accessed June 26, 2018, https://medium.com/ @memoakten/data-dramatization-fe04a57530e4. AUJIK. “AUJIK_STRP AR Graffiti at Strijp-S.” Vimeo video, 3:48. June 29, 2018. https://vimeo.com/277620526. Brouwer, Willem. “Graffiti in tunnel bij Ekkersrijt laat historie weer leven.” ED.nl. 17-10-2017. Accessed June 26, 2018, https://www.ed.nl/eindhoven/graffiti-in-tunnel-bij-ekkersrijt-laat-historie-weer-leven~a2c3eef2/. Brown, C. Scott. “Google’s Just A Line app lets you doodle with your friends in AR.” Android Authority. 21-03-2018. Accessed June 29, 2018, https://www.androidauthority.com/google-just-a-line-ar-app-847861/. Buro 24/7. “App of the week: ‘Just a Line’ lets you doodle in the air with your phone.” Accessed June 29, 2018, https://www.buro247.my/lifestyle/technology/app-of-the-week-just-a-line-lets-you-doodle-in-the.html. De Utrechtse Internet Courant. “Verschillende Utrechtse wijken volgekalkt met graffiti; Wat wordt eraan gedaan?” 24-11-2017. Accessed June 26, 2018, https://www.duic.nl/opmerkelijk/verschillende-utrechtse-wijken-volgekalkt-met-graffiti/. Dohmen, Hub. “Virtual reality (VR) en augmented reality (AR) – juridische aspecten.” Dohmen advocaten. 08-05-2017. Accessed June 28, 2018, https://www.dohmenadvocaten.nl/virtual-revolution-augmented-reality-vr-ar-juridische-aspecten-advocaat-specialist-gespecialiseerd-advocatenkantoor.html. Ferrell, Jeff. Crimes of Style: Urban Graffiti and the Politics of Criminality. Boston: Northeastern University Press, 1993. Freshgadgets.nl. “LZRTAG: Augmented reality graffiti.” Accessed June 29, 2018, https://freshgadgets.nl/lzrtag-augmented-reality-graffiti. Gwilt, Ian. “Augmented Reality Graffiti and Street Art.” In Augmented Reality Art: From an Emerging Technology to a Novel Creative Medium, edited by Vladimir Geroimenko, 189-198. Cham: Springer International Publishing Switzerland, 2014. Hertz, Garnet. “What is Critical Making?” Current – Design Research Journal 07 (2016). Accessed June 26, 2018, http://current.ecuad.ca/what-is-critical-making. Hills-Duty, Rebecca. “Street Art and Graffiti in Augmented Reality.” VRFocus. 18-09-2017. Accessed June 29, 2018, https://www.vrfocus.com/2017/09/street-art-and-graffiti-in-augmented-reality/. McGarrigle, Conor. “Augmented Interventions: Re-defining Urban Interventions with AR and Open Data.” In Augmented Reality Art: From an Emerging Technology to a Novel Creative Medium, edited by Vladimir Geroimenko, 81-95. Cham: Springer International Publishing Switzerland, 2014. Nicoarea, Georgiana. “Graffiti and Cultural Production in Contemporary Cairo: Articulating Local and Global Elements of Popular Culture.” Romano-Arabica Journal 13 (2013): 261-273. Oxford Dictionaries. “Graffiti.” Accessed June 28, 2018, https://en.oxforddictionaries.com/definition/graffiti. STREETART & GRAFFITI. “Hall Of Fame Addresses.” Accessed June 26, 2018, http://www.dutchgraffiti.com/hall-of-fame/. STRP. “01/10/18: 4D Graffiti Invasions by AUJIK.” Accessed June 29, 2018, https://strp.nl/en/program/graffiti-in-ar/. Uricchio, William. “Augmenting Reality: The Markers, Memories, and Meanings Behind Today’s AR.” Forthcoming. WERC Collective. “AR GRAFFITI.” Accessed June 29, 2018, http://werccollective.com/ar-graffiti/.